The gift of Pure Delight. So simple, so out of the ordinary, so much healthier, and so perfect for all ages and tastes. 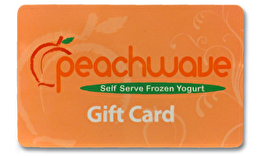 You will be remembered when your gift is redeemed and enjoyed at a cozy, quaint Peachwave shop. Our frozen treats are a unique culinary experience. Why? It starts with making Peachwave frozen yogurt and Italian gelato in micro-batches daily with fresh milk in over 105 delightfully indulgent and ultra-creamy recipes. Then, with up to 75 freshly prepared fruits, premium nuts, grains, sauces, freshly baked waffles, and dozens of other fun toppings at your fingertips, our customers make their own cup, smoothie, shake or float masterpiece. Don't know the dietary preferences of your gift card recipient, but you want to give guiltless indulgence? No problem! We offer super creamy frozen yogurt and gelato that are tart, sweet or reduced sugar flavors. All of our recipes are either non-fat or ultra-low fat. Dairy-free options are available too, such as our Dole Whip vegan-friendly flavors. And finally, most of our recipes are gluten free, contain lots of protein and Vitamin D, have less calories than most ice cream, and have probiotics that are good for your body. Your gift will truly impress! Thank you for your order. 336 East Army Trail Rd. 2611 S.W. 19th Ave Rd. For balance inquiries call the phone number to a Peachwave Frozen Yogurt & Gelato's location below.